Group X’s members Fernando Nieto and Claudia Auer will take part as teachers in the Building Design studio course Future Media Center for Aalto University in Otaniemi, organized by Professor of Building Design Pirjo Sanaksenaho. The course is held at Aalto University Department of Architecture, starting on Tuesday September 13th at 15:00 in Miestentie 3 premises (lecture room 211). The project is based on a real initiative and a need for spaces for a media education center as part of Aalto University. Aalto University has suggested a site in the center of Otaniemi, near the new main building of the School of Arts, Design and Architecture. The Media Center will be an accessible and welcoming gathering place for the public while providing amenities for high quality performances and research in the fields of Media and Film. The building should raise curiosity and reflect the identity of the Future Media Center among the visitors. Strong emphasis is put on the innovativeness and architectural quality of the building as well as the adaptation of the building to the surrounding environment. 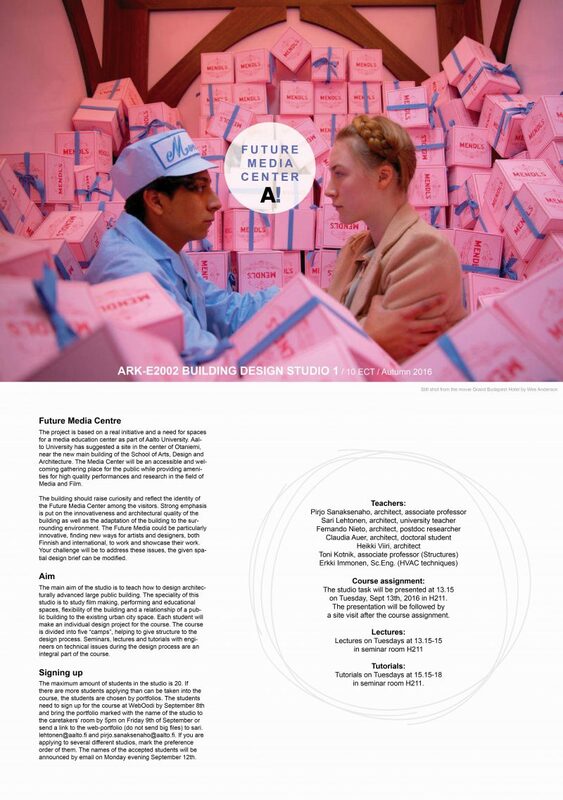 The Future Media Center could be particularly innovative, finding new ways for artists and designers, both Finnish and international, to work and showcase their work.